The WoodenBoat Research Library holds a collection of more than 15,000 maritime books, periodicals dating back to the 1800s, and a large number of boat plans and other resources. These images of Light on the Water appeared in The Rudder Magazine, February 1910, painted by Warren Sheppard. They show the artist’s favorite yachting harbors and landmarks in fond detail, with cumulus storm clouds and eerie moonrises drawing a sailor’s attention. Can you identify which harbors they show? In 1978, a standard 39′ Concordia yawl named BABE won the MHS Division (the new Measurement Handicap System, developed in 1978 by MIT to measure and handicap racing boats, including older boats) of the renowned Newport-Bermuda Race. As one of the smallest boats ever to win that challenging 630-mile ocean race, she added an important chapter to the glory and appreciation of a much-loved class of wooden boat. The bowline is a knot taught in every seamanship class. This article by Edwin Frost, in the April 1948 issue of The Rudder , shows the standard bowline and two of its less well known cousins. Author Charles G. Davis takes a personal joy in each of the boats that he presents in this book, How to Design a Yacht , published by The Rudder in 1906. He talks about owning one sailboat, designing another, delivering a third down the coast to her new owner. He seems to love every one, and shows us through his illustrations and his first-hand encounters scattered through the book. In this 1920 painting by Charles Pears , the sky is cloudless, the breeze seems steady and brisk enough to cause a curling wave at the bow on the boat nearby, and a white wake flows off the stern in a sea of Caribbean blue. Competitors are close, all light sail set, evenly matched. A well-dressed woman is looking ahead; while an assistant is near at hand, ready to leap up at the call to trim! Or perhaps he is the tactician, whispering advice to stay low on the course. A jackyard topsail is rarely seen today, and there are good reasons. The jackyard topsail is a sail with murder on its mind, swinging long spars along the deck, intent on sweeping the crew overboard. If you see a jackyard topsail set today, such as on the P-boat JOYANT or on the NY50 SPARTAN, you should take notice, because under a jackyard topsail lies a brave captain and braver crew, whose full attention will be on that large sparred piece of canvas hoisted high into the sky. A companion piece to Dixon Kemp’s Jackyard Topsail . Kemp’s detailed explanation of the proper way to handle a jackyard topsail safely was perhaps the best possible advice in the 1890s when he wrote it. Compare that with the methods of high-latitude sailors, Tim and Pauline Carr, and the Captain of MARIQUITA, Jim Thom. 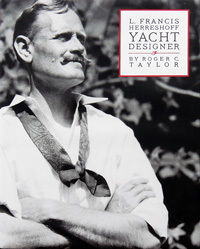 L. Francis Herreshoff, Yacht Designer, by Roger C. Taylor. Volume 1. Mystic, Connecticut: Mystic Seaport, 2015. Hardcover, plans, photographs, drawings, chronology, endnotes, bibliography, chronological index of designs, index. 450 pp, $65. ISBN 978–0–939511–43–3.